There are a wide variety of airport shuttles that operate in Johannesburg, travelling either to Lanseria or OR Tambo International Airport. A2B Transfers is a shuttle company that operates on a global scale, well known for its excellent rates and impeccable service. They operate a shuttle service that services OR Tambo airport and the greater Johannesburg area and can be contacted online, for rate enquiries at quotes@a2btransfers.com or new or existing bookings, contact the company at admin@a2btransfers.com. For travel agent account enquiries contact A2B Transfers at sales@a2btransfers.com. They will be only too happy to assist you online with availability of service, online pricing, confirmation, billing and any travel queries you may have. Holiday Taxis' shuttle service can offer their clientele transportation to over 7,000 destinations locally and Internationally, including OR International Airport, Cape Town, Durban, Port Elizabeth and Bloemfontein. They are located at 62 Huguenot Street in Franschhoek. They can be contacted telephonically on 079 442 6478, via fax on 086 621 5026. Cherry Moss Cars in Franschhoek offer a shuttle to and from Cape Town International Airport and will range as far a-field as Stellenbosch, Franschhoek and the Paarl area. Cumfy Cabs are located at 146 – 3rd Avenue in Grassy Park near Cape Town and provides an efficient and friendly service to the Cape Town International airport and surrounding areas of the city. They can be contacted telephonically on 021 706 6318, 082 662 4812 or 084 583 0412. EZ Shuttle has several branches located nationwide, namely in Gauteng, the Western Cape, KwaZulu Natal, Nelspruit/Mbombela, Port Elizabeth and the George area. They service all the major airports in South Africa and offer a variety of vehicles VW Caravelle’s to VW Jetta Tdi’s and more sizeable coaches for larger parties. Careful planning will always ensure that you arrive at the airport on time as the service always ensures that you are collected fifteen minutes before your appointed time. 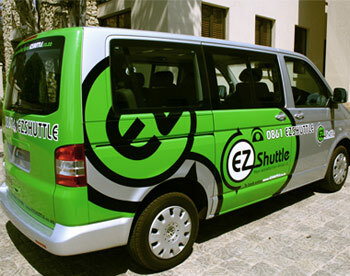 They can be contacted on their 24-hour call line on 0861 397 488 or via e-mail on info@ezshuttle.co.za. Another reliable shuttle service is Xpress Car & Van Rentals, a company that can be contacted telephonically on 083 786 6052, 0861 116 000 or via e-mail at Damien@xpressrental.co.za.